Turn any space into an island of tranquility with traditional Thai cushions. This 4-piece set includes 2 foldable mattresses with a comfortable triangular headrest, and two smaller multipurpose pillows. To ensure superior quality, all our products have double stitched seams, and are stuffed with 100% Kapok. With this set you can create your perfect sanctuary. It can be a place for reading, chatting, relaxing, sleeping, meditating, watching TV, or surfing the web. The small pillow blocks are especially loved by yogis and massage therapists for their firm consistency and natural quality benefits. The Triangle 3-Folds can be folded and stored away easily as well. The lovely traditional Thai fabric works well with moroccan, colonial, rustic, traditional styles, as well as complementing contemporary and casual styles. 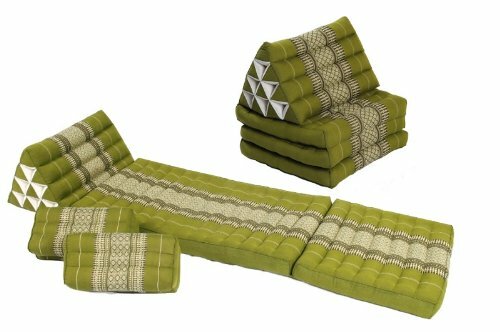 Mutual Meditation Set includes: 2 Triangle 3-Folds: 67x20 inches, Bamboogreen. 2 Yoga&Mediation Blocks: 14x6x4 inches, Bamboogreen. Best Quality only by Handelsturm! Thai Antique Handmade Furniture Bird Gold and Glass Storage Cabinet/Nightstand, Home Decor, 32"H x 12"W x 17"L. Thailand Work Art By WADSUWAN SHOP. Queen size Red Traditional Japanese Floor Rolling Futon Mattresses, Yoga Meditation Thai Mats.